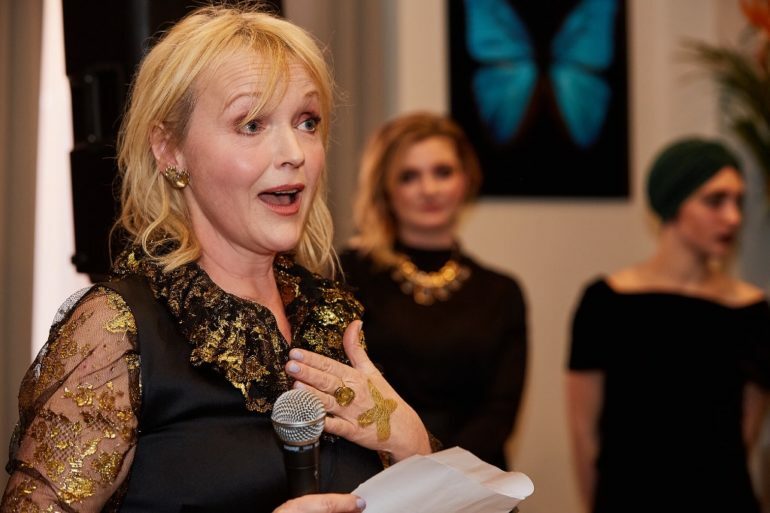 Miranda Richardson, The United Nations and the Whitley Fund for Nature Join Fashion for Conservation on a Mission to Protect the Amazon at London Fashion Week AW18. LONDON FASHION WEEK DEBUTED FASHION FOR CONSERVATION’S AW18 CAMPAIGN TO SAVE THE AMAZON RAINFOREST THIS WEEK. Partnered with WFN [trustee Sir David Attenborough & patron HRH Princess Royal], FFC has engaged influential members of the fashion community to become advocates for grassroots work around the world to protect threatened habitats on which both wildlife and people depend for food, water and life. This season’s three-part series—a preview event, catwalk show and VIP cocktail party—put a media spotlight on the Amazon rainforest, the largest biodiversity hotspot on the planet—home to over 50% of all the world’s biodiversity yet covering only 2% of the earth’s surface. This season’s preview event, Thursday February 15th, hosted keynotes by Ava J. Holmes [co-founder at FFC, TEDX speaker], Steve Fletcher [U.K. director at the United Nations], Miranda Richardson [award-winning actress and ambassador to WFN], and Stacy Flynn [CEO and founder at Evrnu and a Stella McCartney textile partner]. Entertainment included host Elle L’s EP, Cocoon, plus a special DJ set from The Lallas [Lara Fraser, Laura Pradelska]. Cocktails for Conservation followed the show, a VIP celebration with conservation themed sponsored by Snow Leopard Vodka, Elephant Gin, Fair Drinks and Bar 135, keynotes speeches by FFC, U.N., and Whitley Fund for Nature ambassadors, and live DJ set by the LALLAS. Drink proceeds benefited Hoja Nueva, confronting deforestation in the Amazon by protecting land and by providing indigenous communities with the support necessary to produce sustainable crops, and ensure fair direct-trade wages (Hojanueva.org). To close the event, guests were gifted a box of chocolates with a golden ticket to the Whitley Awards Ceremony [April 25th 2018 at the Buckingham Palace hosted by Princess Poyal and Sir David Attenborough]. Guests posted a photograph of themselves with a golden “X” [symbolizing a stand against extinction] painted on every hand to put a social media spotlight on conservation and to help fund efforts around the globe by encouraging donations from their social media followers. Riona Treacy presentation for her AW19 Collection in conjunction with Fashion Scout at The Freemason’s Hall. DB Berdan presented their AW19 collection to crowds during LFW at Fashion Scout.